​An exclusive opportunity to join with Ananta to merge The True Meeting of One Self with Biodanza! Have you had enough of trying to become an achiever in a false world? Have you reached a point in life where nothing else apart from Being Real makes any sense? Are you knowing there must be something else to this Existence and hear the call deeply in your Heart? Are you ready to step into your birthright and live the freedom of who and what you really Are? Meetings with Ananta are like an intimate journey with yourSelf. Realise your deepest Truth, connect to what you know and start living from your clarity. Online booking is now closed, please contact Olga to reserve your place and pay at the door on Sunday. This meeting begins with a deep dropping into Pure Awareness. Followed by an introduction that points to and evokes the Direct Experience of the True Meeting of OneSelf, then Together we will explore and unravel all that stands in the way of Living our True Self. Then from a place of True Freedom... the dance begins! ​On this very special occasion we will fuse Direct Self Inquiry together with Biodanza, we will see who and What is dancing this moment of life into Form! BIODANZA is a dance system for personal awareness enhanced by sensitive interaction with others. It improves vitality, confidence and joyful living in the moment. Men and women of all ages welcome! Guided barefoot dance and movement. 'The Dance of Life', Biodanza is a process which improves vitality and well-being over time. There are dances and exercises for co-ordination, for letting go and to relief the stress. Biodanza is a system of creative movements which was developed in the 1960s by the Chilean psychologist Rolando Toro, and now is loved by people in 54 countries. The vivencia will be led by Olga Bastable. 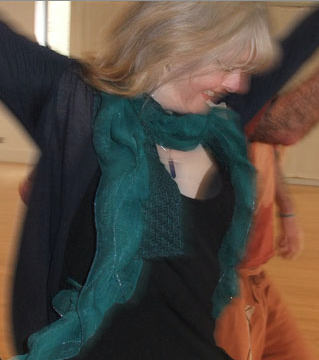 Olga studied at London School of Biodanza for three years and has been running her weekly classes on Friday at Hugh Cubitt Centre in London since 2014. Olga has had over 15 years of experience in facilitating meditation groups, festivals and managing charitable educational projects.